Tropical Cyclone Kenneth is about to bring destruction to Mozambique just weeks after a rare TC left a thousand dead. Image from Meteosat ctsy. EUMETSAT. The experts are saying it will be the strongest storm ever recorded in the area and it comes just weeks after Cyclone Idai which battered south-east Africa and has affected millions of people with the death toll now above 1,000. Kenneth will be the first tropical cyclone with the equivalent of hurricane strength to strike Mozambique's northern province of Cabo Delgado since modern record-keeping. Kenneth has undergone rapid strengthening as is now an intense tropical cyclone with its strength equal to a Category 4 hurricane in the Atlantic or eastern Pacific oceans. Hundreds of thousands of people are still in need of aid after Cyclone Idai battered Mozambique, Zimbabwe and Malawi in March, according to Accuweather. Tropical Cyclone Kenneth is barreling toward the Mozambique coastline just weeks after Idai sent a deadly storm surge into the country and drenched much of the region. 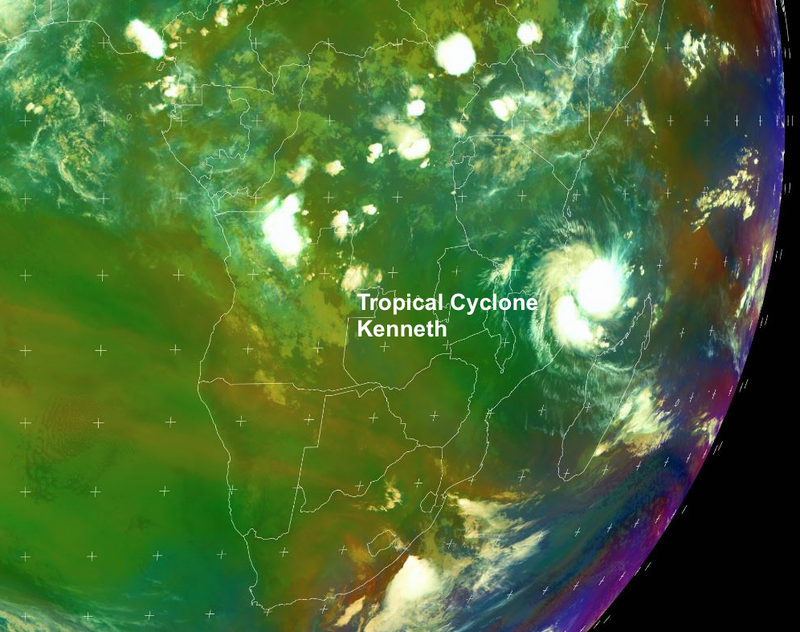 According to the Weather Channell, Kenneth slammed into the Comoro Islands – an archipelago with a population of nearly 1 million people, located between the African mainland and Madagascar – early Wednesday with wind-driven rainfall, storm surge and wind gusts as high as 145 mph. Kenneth's eyewall continues to slam Grande Comore, a volcanic island that is home to Comoros' capital city of Moroni, which has a population of 400,000. Wind gusts as high as 145 mph may be impacting the island. Kenneth is moving briskly toward the west in the Mozambique Channel toward the northern Mozambique coast. This motion is expected to slow somewhat as Kenneth approaches the coast. Kenneth could become a Category 4-equivalent cyclone for a time overnight into early Thursday, but as Kenneth approaches the coast, it may lose some strength as it pulls in some drier air. Tropical Cyclone Idai made landfall on March 14 as a Category 2 storm with 110-mph winds just north of Beira, Mozambique (population 530,000), near the time of high tide, driving a devastating storm surge into the city. Idai also caused enormous wind damage, ripping off hundreds of roofs in Mozambique’s fourth-largest city. 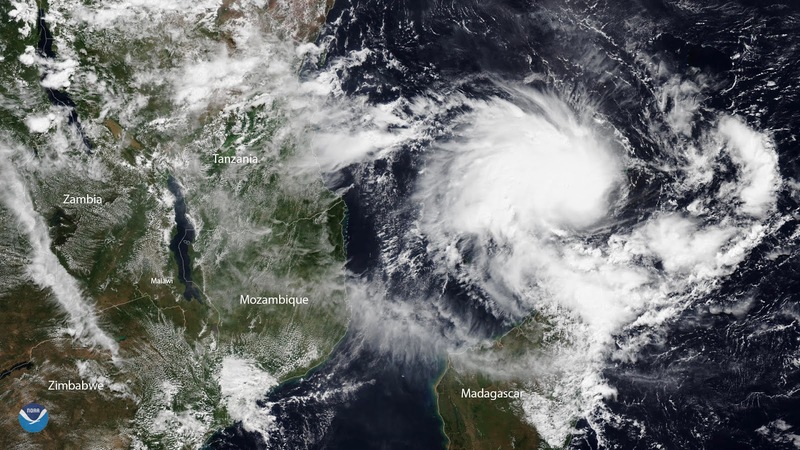 Since the cyclone was large and moving slowly at landfall, near 6 mph, it was a prodigious rainmaker, with satellite-estimated rainfall amounts in excess of 2 feet in portions of central Mozambique. Two major rivers, the Buzi and the Pungue, burst their banks, submerging villages and leaving bodies floating in the water.